Ruling the eCommerce sphere is not just about getting the right customers, but also keeping them interested in your store. Once you’ve attracted leads to your online store, it should be a breeze to turn them into paying customers, right? Not so much. Like any brick-and-mortar store, an online shop can deliver similar personal touches online by using a real-time communication – live chat. According to MarTech, 51% of customers are more likely to purchase from a site that offers live chat. Almost half of say they’re more likely to return to a website with a live chat option. 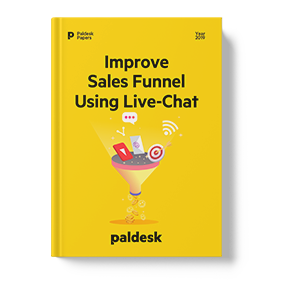 Live chat for eCommerce enables website visitors to gain access to customer support before they are a customer, and get personal sales advice in a way otherwise not possible online. It is a tool to enable the customer experience to start right at the start of the buyer journey – as soon as the visitor hits the site. Why Should E-commerce Companies Use PrestaShop Live Chat Support? Online retail is an industry constantly changing to keep up with growing consumer demands for convenience. Online shopping is now just as popular as in-store, with 51% of Americans citing online as their preferred way to shop. According to BigCommerce’s Omnichannel Retail, 96% of Americans with internet access have made an online purchase at some point in their lives. Four in five (80%) have done so in the last month alone. Americans as a whole are split when it comes to a preference for online or in-store shopping. But when broken out by demographic, it is clear that the younger generations will continue to drive shopping to the digital front. The survey revealed that 67% of Millennials and 56% of Gen Xers prefer to search and purchase on e-commerce sites rather than in-store. Only 41% of Baby Boomers and 28% of Seniors will click to purchase. Online shoppers spend 64% of their shopping budget in store, and 36% online. There is a breakout on how Americans in various demographic groups spend online vs. in store. Furthermore, on the question where American shop online, BigCommerce’s Omnichannel Retail report shows that online shoppers have spent the most with e-commerce marketplaces ($488), closely followed by large retailers such as Nordstrom or Best Buy ($409). It’s obvious that customer service is one of the last areas that physical stores have previously held the advantage over online stores. But that advantage is quickly eroding as technologies such as live chat are becoming more prevalent (and trusted). And shoppers love it too and it’s starting to make an impact on businesses’ bottom lines. As statistics on live chat for eCommerce reveal that 38% of consumers say they are more likely to buy from a company if they offer live chat support. So why is PrestaShop live chat so effective at encouraging purchases and why should e-commerce companies use it? For pure eCommerce companies, PrestaShop live chat is the only opportunity for customers to interact with the company. Even with companies that have stores in the real world and online, consumers see businesses that offer live chat for eCommerce as more approachable, helpful, and customer-centric. It’s no secret that online shopping is on the rise. However, the convenience of online shopping often comes with the risk of not being able to physically interact with the item or salespeople during the decision making and purchasing stages of the buyer journey. This has given rise to the practice of showrooming, where customers visit a store to research an item they are interested in by asking questions of the sales staff, but go away and buy online where it’s often cheaper. Live chat goes a long way to recreate the research experience for customers and make it even more convenient. The buyer doesn’t need to take time from home or work to go to the store or make a potentially expensive and time-consuming phone call to find the answers they need before they commit to purchase. Some 83% of shoppers report needing help at some point during their buying process, which provides a ripe opportunity for businesses to provide a good experience to meet their needs before they commit to buying. Bounce rate or Exit rate is a metric representing the percentage of website visitors who navigate away from the site. It stings to have 65% of your hard-earned visitors bounce off the site on their first visit. A high bounce rate not only hurts sales but your site ranking on search engines as well. You can get rid of this high metric by improving the site’s content or usability to engage visitors. It takes time, though. With all high-quality solutions for website, still, some people will not be able to find the page or information they are looking. That is why PrestaShop Live Chat is one of the best ways to solve this problem of a high bounce rate. With live chat support, you can have a real engagement system, live support, guided navigation, and better sales. Customers love to live chat. That’s the finding from statistics on live chat for eCommerce, in which 41% of those who were asked, said they preferred live chat than a phone, email or social media. This makes up the highest satisfaction level among all customer service channels. Chat has killed the phone call. Wonder why? PrestaShop live chat ensures timely interaction that a ticket or email system forever lack. People are always in a hurry. No one is patient enough to sit down and write an email just asking for available colors of a coat. Also, you can use live chat ‘on-the-move’ chatting with its support. Thirdly, customer’s history and activity are recorded for better support in the future. All these considered live chat is no doubt a must-have support solution for your e-commerce customer-driven business. Live chat provides an opportunity for you to learn more about your visitors or potential customers. The amount of data live chat support software generates is worth the investment. You’ll acquire information such as the referring link (how the customer came to your site), which operating system or device they are using (e.g. mobile, tablet or desktop), how long they spend on your site, how many times they have visited, their location, are they actively clicking/scrolling through the page, etc. You can use the data you collect to improve the customer experience and take your marketing efforts to the next level. The more layers of data you have, the better you’ll be able to tailor your online shop to your customer’s needs. Doing business is not just about selling, but about gaining trust and long-term relationships as well. For shoppers buying online, taking the plunge to make a purchase requires trust in the site and the company they are purchasing from. People tend to feel more confident and at ease purchasing at a site where a real human is available to guide them through the searching or checkout process. As long as their experience stays pleasant, chances are they would come back more often. Happy buyers are loyal customers. PrestaShop Live Chat increases the potential of your e-commerce business, but only when you apply it correctly in your business. Live chat can have negative effects from your site if it’s implemented badly, but find out how with live chat can benefit both your customers and your business. Be available when your visitors need you. Sounds obvious, but how many companies focus only on the working hours in their own time zone? When you’re at work, chances are so are your customers. To really maximize your online sales, make sure your live chat is on and available when your customers are looking to buy from you. If you don’t know when that is, invest in keeping your live chat live for 24 hours a day for 1 to 2 weeks and then measure your peak hours. But, usually, the live chat feature should be available 24/7. Hire freelance support agents so that you can assist visitors 24 hours a day. Provide a quick response. Seconds count when you’re looking to help a customer and close a sale. When visitors enter their concerns into your live chat window, respond immediately. One of the main reasons people use live chat is to avoid telephone hold times or wait hours (days?) for an email response. They want answers, and they want them now. Your fast response time will increase your close rate and your bottom line. Use responsive live chat. Your target audience is moving to smartphones and tablets, even and smartwatches. Better offer them live chat feature across all devices, not just desktop. Test your customer support, representatives. The line between creepy and helpful is very thin. They must be more than support agents – they must be trained to act as a salesperson. If you and your agents are doing your jobs correctly, you know a hell of a lot more about the customer asking questions that you want to acknowledge. Your customers value their privacy. Give them some space, and don’t reveal information that shows you’ve been monitoring their interactions with your site. Offering general help is fine, but too much detail will likely feel invasive. Strategically choose how you show yourself. Make sure that customers who are interested in chatting will know where they can click and request help and those who aren’t interested will be able to ignore it. Your button shouldn’t distract from the products and services you’re selling. In retail, we call this an “approach zone.” You don’t want to get jumped on by a sales associate the minute you walk through the door. Be helpful and available, but using aggressive pop-ups or light-box technology, for example, to take over the page and force someone to click yes or no to your offer to engage is bad for business. Don’t be pushy and leave your customers time to research. Are you ready to get started? People need assistance, They don’t just need a sales page, product videos, product description, and all those discounts, they need a human to speak to. Is your e-commerce business ready for bringing live chat alive? Before you even ask a web developer to set up PrestaShop live chat software, make sure that you have enough traffic on your e-commerce site. If you don’t or you not happy with as is situation, Google Adwords campaign and search engine optimization will be a better way to spend your money. Wonder why? Businesses might not be receiving enough chats to justify the cost. Keep in mind your number of visits, engagements, and costs of solutions, but if you’ve got several hundred dollars-worth sales after the chat, that is more than enough to cover all the expenses for a monthly chat subscription. Basically, placing a live chat on the website is easy – in most cases, it’s a simple copy/paste operation on a piece of code. But, if you’re not familiar with tech, you should have one person who will take care of chat setup and maintain. Don’t forget to adjust the chat to your website’s look and feel. Change the colors, add a logo, use real names and pictures of your customer service staff. This will make the website and the chat look professional and your business will be perceived as transparent, reliable and trustful. It may seem obvious but it’s true – and it applies just as much to e-commerce as to any other business. Customers who have a great experience with a company will be much more likely to become a repeat purchaser and a loyal brand advocate. This is why providing great live chat is so important. To achieve this, your business should have live chat operators knowledgeable about web support and quirks on the website. They need to be information gatherers and always there for customers. PrestaShop live chat’s purpose is to provide your customers with on-time help and accurate information.